We’ve had a glut of courgettes – we got so many of the blimmin’ things they turned into marrows as we couldn’t eat them fast enough. So, what to do with them? This massive whopper pictured above I turned into a Spanish-style stuffed marrow dish, adapting it slightly from a recipe I found online to make it low-carb. Another trick is to salt the marrows for an hour or so before cooking. This will make the finished product less watery. Slice the marrow in half length ways and then width ways, scoop out the insides and sprinkle with salt. Place them on a rack, flesh side down and then wipe thoroughly with kitchen paper before using. Heat the olive oil in a pan and add the onions. Cook over a gentle heat until soft and lightly browned – this won’t take as long as cooking normal onions. Add the chorizo and cook until the fat begins to run – about a minute. Add the tomatoes, garlic, paprika, oregano and Cayenne pepper. Bring to a simmer and cook for ten minutes. You want a nice, thick sauce. Season to taste – you won’t need much salt because of the chorizo, cheese and the marrow already has some salt in it, thanks to the pre-salting. Place the marrows in a large oven-proof dish, cut side up. Fill them with the tomato/chorizo mixture and top with the cheese and a good grounding of black pepper. Cover the dish with foil and cook in the oven for 30 minutes. Take the foil off and cook for another ten minutes to brown the top. About 12g net carbs per serving. There you go, I didn’t know that courgettes were baby marrows! I do something highly similar, but I cut the marrow into thick rings, go round with the back of the knife blade (“blunt dissection”) to remove the pith, and use a combination of ground beef and chopped bacon where you use the chorizo. Oh and I use grated cheddar on top. Hmmm, where’s ,my shopping list? LOL Zucchini, I thought what you were talking about was something completely different. Emma, a lovely tasty recipe idea. No bother, Jan! Chris’s version in the comments looks good too. OK, you try mine and I’ll try yours! Only it will have to wait until next week though, they had some nice looking runner beans in the veg shop and some even better ones on a friend’s roadside stall and now I have to eat them all up. 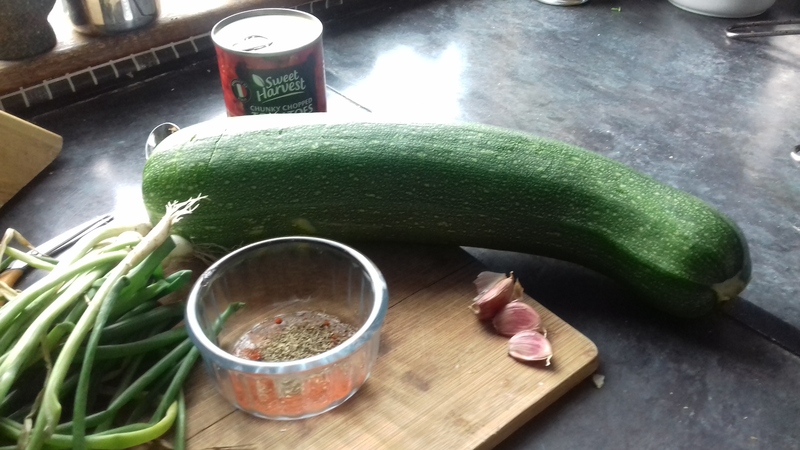 It’s a deal – though I might just be stuffing courgettes as the rest of them have stayed that way. Enjoy your runner beans.